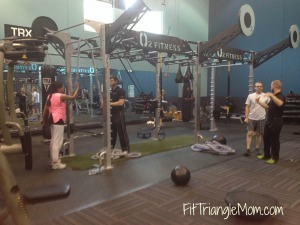 I was recently invited to visit the O2 Fitness Club in Cary. They have several locations throughout the Triangle and two in Wilmington. I’ve always heard nice things about the club from a few of my friends that are members, but an actual visit is the best way to determine if a gym matches your needs. 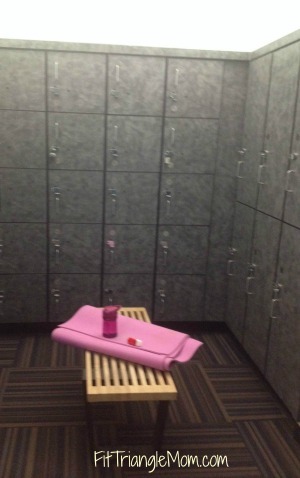 The club offers childcare and a full locker room with a sauna and showers, perfect for busy moms. I wish I had more time to relax in the sauna. 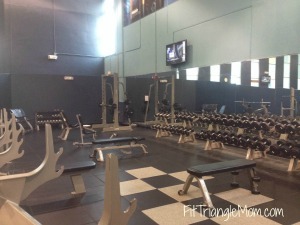 The main floor consists of the equipment and exercise machines. I was impressed by the amount of treadmills, ellipticals and bikes. Everything looked brand new and clean. The weight room was separated from the rest of the equipment by half walls, giving the heavy lifters a little extra privacy. There was even a section for weight machines, TRX and other exercise stations. The main exercise room was fantastic, but my favorite part of the visit was the group classes. I signed up for yoga and ballet barre. My first class was yoga, and I was warmly welcomed by the instructor, Loretta. I rolled out my mat, took my shoes off, and then I looked up. The view was amazing. The 2-story studio room had the typical wood floors and walls covered in mirrors, but above the mirrors were several large windows that allowed for beautiful sky views. The hour long yoga class worked my tired muscles and invigorated me to try new poses. The Cactus pose was our theme for the class, and Loretta jokingly mentioned we looked like field goals, excellent for football season. 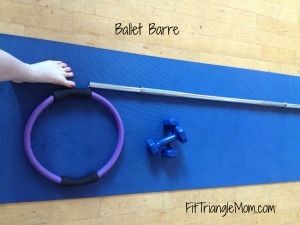 Next I tried, Ballet Barre. I took ballet briefly as a kid, so I was unsure as what to expect for this class. The class was held in the same room as yoga. I imagined wearing ballet slippers and holding a bar on the wall, but ballet barre at O2 is a little different. No slippers, just barefeet, and there was no bars on the wall, just a barbell without the weights. It was a full-body workout with squats, lunges, planks, and weights for arm exercises. There were bursts of cardio to keep our heart rate up. I really enjoyed the mix of participants in this class– all shapes, sizes, ages, and exercise levels. Our instructor, Chelsea demonstrated three levels difficulty for each exercise, so that everyone could participate based on their ability. I was hot and sweaty after this class, so I knew it was definitely a good workout. Thank goodness for the showers. Whether you are looking for a refreshing yoga class, an exerting full body workout or maybe just a run on the treadmill then O2 Fitness has it for you. The Cary location also has a pool for water aerobics and swimming laps. Like I said, the best way to find out if a gym fits your needs, is to try it on (visit). O2 Fitness offers free trials to prospective members. Just visit O2 Fitness Trial Membership to check it out for yourself. O2 Fitness offers several different types of payments options to meet your needs. I like the month-to-month option because it allows you to mix up your workout routine- take some classes or swim. Wow! This facility looks absolutely amazing. I love the beautiful room where classes are held. Stunning. The Cary O2 location has a large, open feel to it. The windows in the studio room were my favorite. Thanks for commenting, Susanna. That place looks beautiful! I always look for child are first since it’s a necessity for me. Then probably a lot of variety so that I can switch it up when my routine gets boring. Great post Rachel! O2 offers a great mix of classes plus an array of exercise machines, so you won’t get bored. Thanks for commenting, Michelle. Thanks for the info! Looks like a great gym! I look for a gym that’s fairly close to where I live, that has great group classes and a clean and open environment. That’s another thing I liked about O2 Fitness, the cleanliness. Everything looked new and clean. Thanks for commenting. 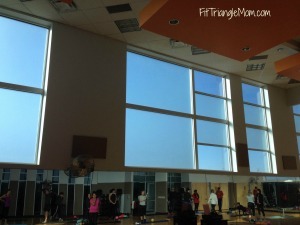 I look for some awesome group fitness classes! 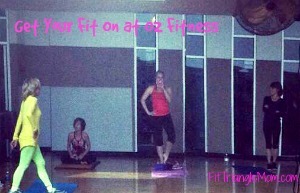 I just took 2 of the many fitness classes that are offered at O2 Fitness. Visit this link to see a list of all their classes- http://www.o2fitnessclubs.com/group-classes/ Thanks for commenting. You’ll like O2 Fitness. It’s a gym with something for everyone- classes, weights, treadmills, childcare, and some have pools. Thanks for commenting. Child care is great but I would love to find a gym with a convenient class schedule! Andrea, O2 offers classes all throughout the day, to fit your schedule. Thanks for commenting.